Marlon Sandro was expected to be the guy producing a flashy finish, instead it was the usually workmanlike Pat Curran who did so during the back end of the Bellator featherweight tournament quarterfinals in Hollywood, Fla.
Sandro, a huge free agent signing for Bellator, had to go the distance with Genair da Silva Jr. to pull out a split decision win. Curran, back down at 145 after a lot of success at lightweight. finished Luis Palomino with a very uncommon submission, the Peruvian necktie at 3:49 of the first round. Both fighters move into the tournament semifinals in July. Bellator announced that Sandro will face Nazareno Malegarie while Curran takes on Ronnie Mann. Also on that card is Bellator's featherweight champ Joe Warren, who'll battle the Season 4 tournament winner, Patricio "Pitbull" Freire at Bellator 47 in Rama, Canada. Warren (7-1) hasn't fought at featherweight since he beat Joe Soto last September. The division has added so much talent and developed so quickly, Warren may not even be amongst the top five 145 pounders on the current Bellator roster. Pat Curran (14-4) would certainly give the smallish Warren a run for his money. 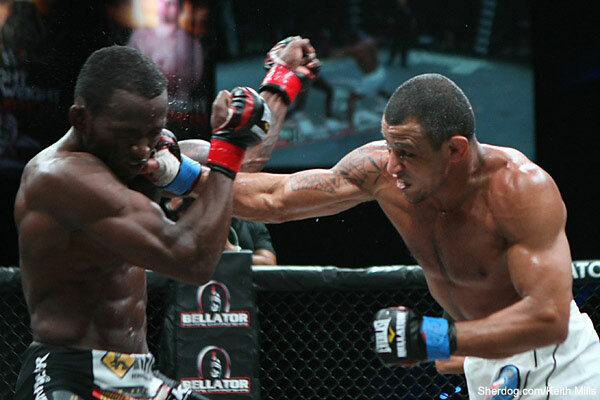 Curran was very competitive during his lightweight fights with Bellator. He upset Roger Huerta last May and began the former UFC star's demise. Then he went the distance with top six lightweight Eddie Alvarez. Tonight in Florida, he looked awesome at featherweight. Possessing heavy hands, Curran dropped Palomino with a huge right, just over two minutes into the fight. A stunned Palomino tried to secure a takedown, but the scramble resulted in Curran eventually scoring his own along the cage and gaining top control. With his cousin Jeff, a former WEC champ and jiu-jitsu black belt, in his corner, Curran began to show off his quickly improving submission. The 23-year-old worked a d'arce choke. When that wasn't working, he transitioned to highly unusual Peruvian necktie. The pressure of cranking back with hands, hips and legs made it impossible for Palomino to survive. "Once I just sunk it in, I went for it. I practice it all the time in the gym," Curran told MTV2's Jimmy Smith. "I was glad I got a chance to show it off. I rocked him with the right hand. He felt a little weak while he was still getting his mind back together." It wasn't as easy for Sandro, No. 5 in the USA Today/Bloody Elbow 145-pound rankings, against the fellow Brazilian da Silva. The former Sengoku featherweight champ started strong. Just over two minutes into the fight, Sandro dropped da Silva with a nasty left. He jumped on top and pounded away, but the referee Jorge Alonso wisely let da Silva scramble his way out of trouble. Sandro, 34, tried a guillotine choke, but da Silva eventually got his head free. In the second, Sandro (18-2) continued to land solid shots with front leg kicks and by getting off first with his hands. Da Silva tried to counterpunch, but was way too wild. The pace slowed in the third and da Silva landed his best punch of the fight, a right hand with 3:55 left. Da Silva tried two takedowns against a tiring Sandro and whiffed on both. Sandro made good on 1-of-2 down the stretch. Cagewriter scored it 30-27 for Sandro, but the judges were split. The Florida trio scored it 30-27, 29-28 and 28-29 for Sandro. The pressure's on Sandro, the highest-ranked fighter remaining in the field. Frankly, it looks like he might be a little overrated. His only losses are against new UFC signee Hatsu Hioki, and Michihiro Omigawa. Omigawa lost a disputed decision at UFC 131, but he's been less than impressive in his second chance with the promotion. We'll find out what Sandro has in North American fight No. 2. The Bellator semis should be explosive. This is an excellent group.